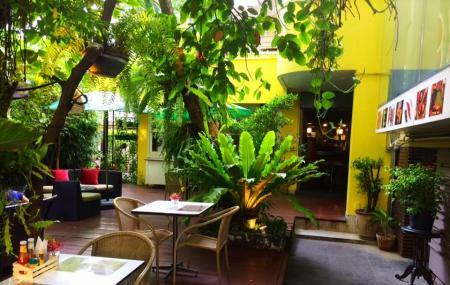 Although located in the central nightlife area of Sukhumvit, the Zanzi Bar with its excellent tropical ambience and lush greenery around the complex looks exactly like a beachside shack. The signature pizza and pasta on their menu might give you an impression that this is an Italian restaurant, but actually it specializes in Thai and Western Food too. The twilight lights, quirky decors, abundance of plants to the interiors create a dreamy atmosphere inside while the traditional lanterns, foliage and umbrellas on the porch and terrace give its exteriors a feel-good vibe. Apart from the chicken, prawn and mussels, you should definitely try their signature cocktails, namely Thaijito, Bangkok-tini, Bangkok-Sling, Sang Som and so on. There is live music every day that boosts up the mood. Nice restaurant with a mix of Thai and italian options. Wood fired oven results in some very nice pizzas which was a pleasant surprise for this part of the world. Good ambience with outside seating and a live band. Is quite pricey compared to other options which costs it a star. I’ve been here every time I visited Bangkok over the last 18 years. Sadly, the place is getting worse over the years. Food was super ordinary this time in April 2019. Music is still very good, but expect 70s rock music. 3 stars is adequate IMHO. Loved the ambiance of Zanzibar. Outdoor dining surrounded by tropical plants and trees, live band playing soft, popular music, good food at a fair price. Do not expect an extensive Thai menu, however. Zanzibar serves a few Thai dishes, but many more Italian dishes. My wife and I ordered two of the Thai selections: Pineapple Fried Rice and Shrimp Pad Thai. Both were delicious. Amazing wood fired pizza. Nice break from Thai food. Fantastic service and good atmosphere.